Here is a great article that Z passed on that breaks down how to set it up if you are Mac user and would like your kids to be able to have access to your computer or their own computer. ~ from “The Sufferings of Christ” by J.C. Ryle in Jesus, Keep Me Near The Cross: Experiencing The Passion and Power of Easter, edited by Nancy Guthrie, pp. 58-59. Yes! chocolate is good for you! Finally, some good news for those chocolate lovers out there! A new study proves that small doses of chocolate everyday can lower your chances of having heart problems by nearly 40 percent, AP reports. German researchers followed around 20,000 people over eight years and found that those who had an average of six grams of chocolate a day, about the size of one square of chocolate, had a 39 percent lower chance of getting heart attack or stroke. The article goes on with a couple of paragraphs about white vs. dark chocolate and the danger of eating too much chocolate. So eat your favorite candy bar but make sure you read the rest here. Recently, Tom White, from The Voice of the Martyrs USA and Michael Wurmbrand, the son of the founder of VOM, Richard Wurmbrand, had the opportunity to go to Romania and visit the prison that Richard and Sabina Wurmbrand spent time in. This is an amazing journey into one of the most depressing and desolate prisons. In this 30 minute video you will hear Richard Wurmbrand share his feelings about his mom and dad being in this prison. You’ll also see Tom White share about his time in prison and how Richard Wurmbrand offered to take his place while he served in a Cuban prison. And you’ll also see the barbed wire that Tom takes to commemorate his visit to the prison. There are also other moving testimonies in this short film, that will move your heart. This is an amazing video of the never seen before prison of the founder of The Voice of the Martyrs. Please take some time to watch this and be inspired. And may this continue to spur you on to pray for the persecuted church worldwide. John MacArthur explains in this 5 minute audio. After you listen you can join the conversation as well. 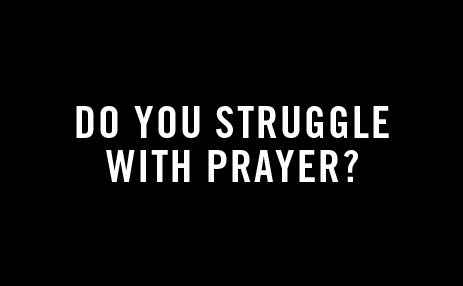 Do you struggle with prayer? I have always struggled with prayer as a Christian. I was sharing my frustration one day with my seminary professor and spiritual disciplines guru Don Whitney. Dr. Whitney shared with me a quote for George Müller, a godly giant of the faith who also struggled with prayer. This is from an entry in George Müller’s diary, dated May 7, 1841. Whitney pointed out that Müller excelled in prayer only after he meditated on Scripture, that “getting his soul happy” was accomplished through meditation, which enabled communion with God through prayer. I became utterly convinced of this method and have sought to practice it ever since. What Does It Mean to Meditate on Scripture? The Greek word for meditate means “to attend.” To meditate is to read with attention to what the verse is saying and then seeking to understand the verse its context. The Hebrew words for meditate are hagah, which means to ponder or imagine (Joshua 1:8; Psalm 1:2), and siyach, which means to converse with oneself, to pray (Psalm 119:15). So meditation is when we pay attention to God’s Word, understanding it in relation to its context. It involves pondering God’s Word, asking questions about the application of its truth, speaking that truth to oneself, and using God’s Word in prayer to God himself. Below is a sample meditation following these guidelines. What does it mean that God is my Lord? What is he Lord of? What does he want to shepherd me through right now? God, in what ways are you providing for me that I am not even aware of? “It is in meditation that the heart holds and appropriates the Word. . . . The intellect gathers and prepares the food upon which we are to feed. In meditation the heart takes it in and feeds on it” (Andrew Murray). Meditation is not just praying, nor is it merely reading Scripture. Meditation is prayerfully reading Scripture, taking God’s Word and turning it into a prayer to God.